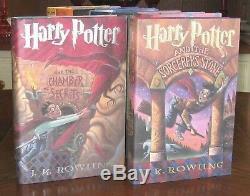 COMPLETE HARRY POTTER SERIES SET. ALL FIRST EDITION HARDCOVERS -- NO BOOK CLUBS. RARELY OFFERED LOT OF SO MANY 1ST PRINTINGS. WITH BEEDLE , FANTASTIC BEASTS , QUIDDITCH, & HOGWART'S JOURNAL. High-grade copies for serious collectors. 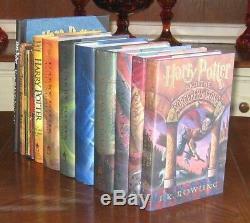 True complete set of Rowling's Harry Potter fiction (everything except the Fantastic Beasts screenplays). This collection includes Books 1-7 in the main series, plus "Book 8" (Cursed Child), plus the three "textbooks" referenced in the story, plus a bonus book of one of the first HP journals. All first American trade-edition hardcovers Arthur A. All show correct quarter-cloth bindings with gilt lettering on spines and "diamond" pattern covering most of the boards. All show correct colored endpapers. No later trade editions, book club editions, reprints, or paperbacks. Eight books are also true first editions (first printings, with "1" in the number lines, of first trade editions). 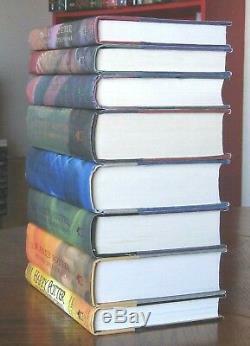 All books in the main series (1-7) are true first editions except Books 1 and 2. Very hard to find such a set online. Nine books are UNREAD, with strong resistance in the hinge, sitting very square/flat/tight. Harry Potter and the Sorcerer's Stone (1998), 46th Printing, UNREAD. Harry Potter and the Chamber of Secrets (1999), 2nd Printing. Harry Potter and the Prisoner of Azkaban (1999), 1st Printing. 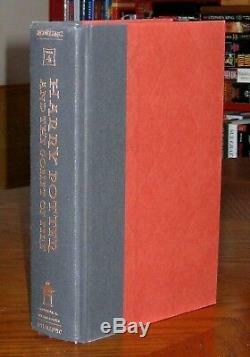 Harry Potter and the Goblet of Fire (2000), 1st Printing, UNREAD. 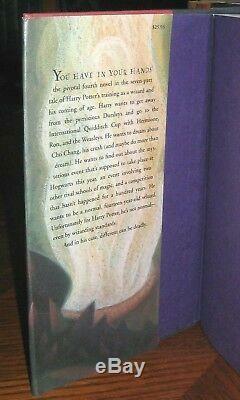 Harry Potter and the Order of the Phoenix (2003), 1st Printing, UNREAD. Harry Potter and the Half-Blood Prince (2005) , 1st Printing. Harry Potter and the Deathly Hallows (2007) , 1st Printing, UNREAD. Harry Potter and the Cursed Child (2016) , 1st Printing, UNREAD. This is the true first edition, the "Special Rehearsal Edition, " not the later corrected edition published in 2017. A play, not a novel, but based on an original story by JK Rowling and written by Jack Thorne. Fantastic Beasts & Where to Find Them (2001), 2nd Printing, UNREAD. Comes in the original first-state slipcase of the true first edition box set, not the second-state slipcase. Quidditch Through the Ages (2001), 2nd Printing, UNREAD. Tales of Beedle the Bard (2008) , 1st Printing, UNREAD. 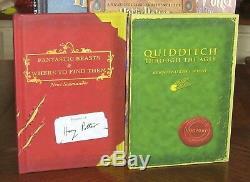 Harry Potter: Hogwarts Journal (November 2000) , 1st Printing, UNREAD/UNUSED/BLANK. One of the very first HP journals and one of the first examples of pre-movie HP merchandise. Not easy to find in high-grade unused 1st/1st state. All books and jackets FINE (truly like-new) or NR-VERY FINE (close to brand-new). 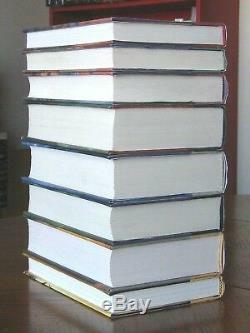 All books show excellent strong bindings with no spine leans. Remarkably, for a large set of children's books, there are no owner names or inscriptions, no interior markings, no highlighting/underlining. No sunning or extremely minor sunning to page edges. The UNREAD books feel never fully opened, with good resistance in the hinges. Bright jackets with great color and no tears, chips, creases, fading, soiling, discoloration; extremely minor edge and corner wear. 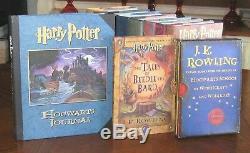 See all my Harry Potter listings. Is a virtually flawless copy, new or like-new and probably never read. Fine (F) is a copy with no large defects, but is not as pristine as a very fine copy. It may have been read, but with care. Possible minor flaws include a bumped corner, a slightly sunned spine, rubbing, slight soiling, or a very tiny tear. Very Good (VG) is a copy with two or more small defects. It may be rubbed, have a small tear, a dinged corner, or other minor defect. Good (G) is a copy with some obvious large defects and/or several small defects. There may be a larger tear in the dustjacket, a large gift inscription, be very sunned, have a creased spine, or have other defects. Many ex-library books fall into this category. Makes a good reading copy. Fair (F) indicates a copy with very serious defects. It may actually have some loose pages, underlining or highlighting, or be very soiled. Store: I specialize in first-edition fiction (1960s-1990s) and high-grade PSA-graded sports cards (modern). All sales help fund graduate school. Thanks very much for visiting. Books are packaged with care in combinations of bubble-mailers and boxes to ensure they arrive in the same condition as described in the listing. I'm fair about this, please ask with any questions. 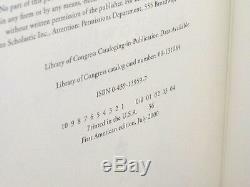 The item "(12) HIGH GRADE COMPLETE JK Rowling Harry Potter 1st Ed HCDJ Set, 8 1st Printing" is in sale since Sunday, January 20, 2019. This item is in the category "Books\Fiction & Literature". The seller is "3853buckeye" and is located in Hamilton, Ohio. This item can be shipped to United States.